Christmas trees are the spokes-tree of the holiday season. People love to dress them up and show them off. While the traditional Christmas tree is either an artificial rendition or the more ambitious route of hauling the family to a tree farm and chopping down a live specimen, there are nontraditional routes you can take to put your home in the holiday spirit. This tree is perfect for any vino enthusiast, just save up your bottles all year long and stack them up in a tree-like fashion after Thanksgiving. We don't know about you, but this is a great reason to drink a robust Cabernet. Mix and match the colored bottles for an extra festive touch. If you like the wine theme, you can go smaller scale with a wine cork tree. Grab a hot glue gun and a variety of corks and start building. Add some green to the corks with a marker and top the whole simple project off with a bow. For a little extra pizzazz add some icicle lights! Okay, so this is definitely not a tree to last the whole holiday season, but it is a great addition to any party. Easy, festive and delicious, you can't go wrong with this twist on a crudites platter. Put your Christmas tree on the ceiling. Why not? This look is an eye-catching twist on the norm, but also has some practical purposes. Babies? Puppies? Check! Now you don't have to worry about them pulling the tree over on themselves. This may be the most simple switch up of them all! 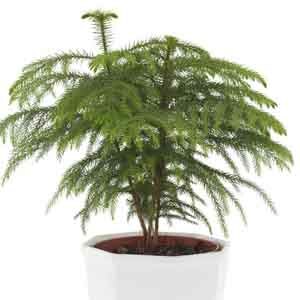 You can stop by your local garden center and pick up a Norfolk Island pine and voila, instant Christmas spirit! No muss, no fuss and they are small so they can decorate any area of your home without moving furniture or stressing. How do you like to Christmas tree? Share your ideas in the comments below.